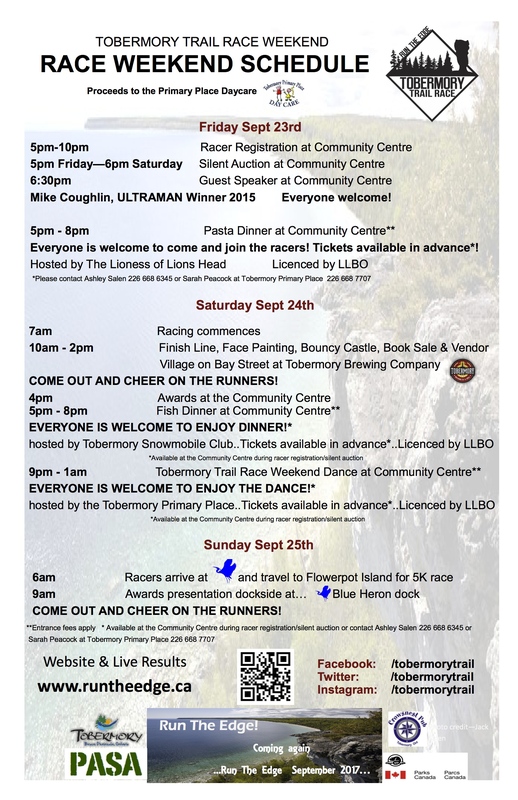 Incredibly, the 2017 Tobermory Trail Race Weekend is now sold out! Thanks to everyone who picked up an entry in the past 3 days. Peninsula Adventure Sport Association (PASA), Parks Canada and the Tobermory Chamber of Commerce will be sure to provide a great experience for you all. You’re also supporting a great cause in Primary Place Daycare and other non-profits here on the Bruce Peninsula. Please rsvp to our Facebook event if you either need to switch into or out of a registration: an admin fee of $20 will apply. Thanks for supporting this unique event & although efforts are made to grow the capacity of the race slightly, we respect the privilege of hosting an event in such a beautiful natural landscape and keep within the constraints of the regulations that protect it. On top of this, PASA strives to make all of its races low-waste and low-impact & our mission is to make Bruce Trail ambassadors of you all! joining the email list here. Thanks again & happy training. Please check out the Feb 4th Wiarton Willie’s Groundhog Jog at Wiarton Willie Festival to bridge the gap between the fall and spring running season. All Races are now on sale! *update: event is sold out!